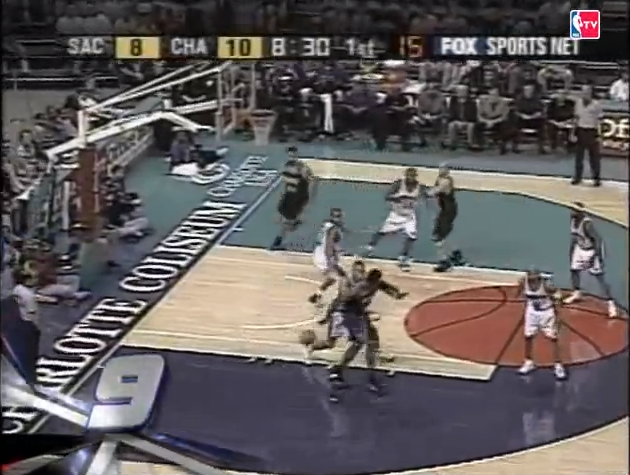 One of several behind-the-back assists from Webber. Last season was the first with player tracking data logged for every team. While this continues to be nothing short of fantastic, the early-2000s feel like the Stone Age and the needy side of me wishes it was available for players of that era and earlier. One example is Chris Webber and his passing. Among other dishes, watching him on the low post whip the ball behind his back to a cutter is a timeless joy. I could only watch so many of those highlights while attempting to write about his scoring before tallying up some passing stats, even some we’d see from the player tracking data today on NBA.com. 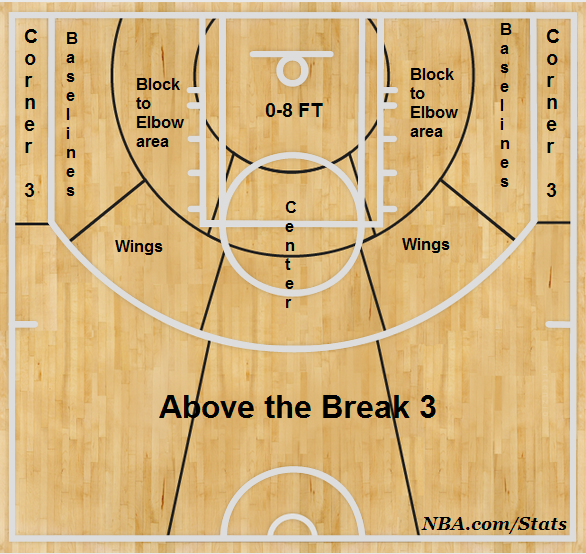 NBA.com has assist charts back to 1998 with shot locations from them, so I made distribution stats to sort through. One sheet has the basic shot zones and another uses NBA.com’s from their shot charts. (Names I gave each location can be found in a screenshot). The small percentage of threes make sense with Webber taking 2.9 per game himself and 33% of all attempts from there while on the floor, per NBA.com. No other starter averaged more than 0.6 attempts or cracked a 3P% of 30. Fun times. In 21 games in 2005 for the 76ers, there’s a spike in assists to the corner 3. That can be explained by Kyle Korver assisted eight times there and 21 overall. The decline from 3 with Philadelphia in 2007 could be explained by Allen Iverson‘s 3P% falling off a cliff before he was traded, Webber logging 264/544 minutes with Kevin Ollie who took 2 threes all season, no stretchy bigs, and the 2007 Sixers being super weird all season. There’s the trade of guards from Jason Williams to Mike Bibby. Webber logged 9.39% more of his minutes with the latter player who took nearly 1/3 more of his shots from mid-range. In 2002, Webber also played 17.47% more of his minutes with Hedo Turkoglu compared to 2001 and 10% less with Stojakovic. Between the two wings, their mid-range rate was about the same but Turkoglu had a slightly lesser three point rate. That was all from Basketball-Reference (table of % of MP w/ Webber here). So the assist distribution looks fairly roster-dependent. The same can be said while comparing Webber’s %s with a few others: Kevin Garnett, Mike Bibby, and LeBron James. It wasn’t just KG who loved mid-range shots in Minnesota. Ray Allen helped alter his and LeBron’s assist distribution when teaming up with each, but Shane Battier playing alongside James the last two years more than Udonis Haslem helped too. The differences with Bibby and Webber make sense with their pick and pop game (Christie + Webber too, and Bibby with other bigs). In 2002, 55% of Bibby-to-Webber assists were from mid-range, per NBA.com. Looking at individuals assisted by Webber, here were some where he was their primary feeder: ’98 Rod Strickland, ’99&’00 Peja Stojakovic, ’01 Jason Williams, ’01-’05 Doug Christie (minus ’04), ’03&’05 Mike Bibby, and ’06 Allen Iverson, according to NBA.com. It’s vague as I just took total assists without weighing it with anything else like minutes with Webber versus other passers, but there’s no lineup data available pre-2001 to match NBA.com’s stats back to ’98. It does make me think, though, that in 2006 Webber would total more assists alongside a sharpshooter like Stojakovic, but with Iverson he’d collect more free throw assists. 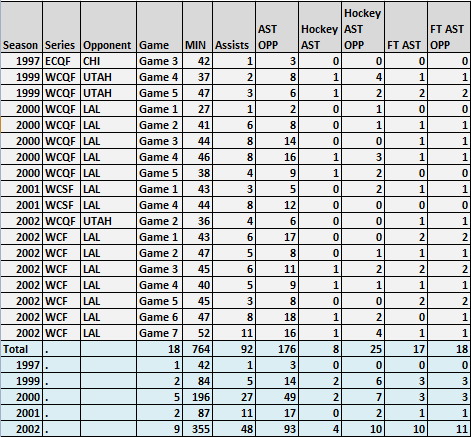 Those were some pretty decent defenses: The ’97 Bulls, ’99 Jazz (faded badly though), and the ’00-’02 Lakers. Dreadful defenses vs Sacramento probably paid a steeper price for being a half-step slower versus Webber, with him likely carving out more hockey and FT assists versus them. Webber still stuffed the stat sheet even with teammates who didn’t take full advantage of primary and secondary assist chances. The 1999 and 2000 Kings were 5th and 3rd in 3PA rate, respectively, but 24th and 28th in 3P%. Stojakovic was still growing into the scoring shark he eventually became, Williams had a quick trigger, and Corliss Williamson was not a small forward who was going to stretch the floor. The 1999 Kings still had some flash, but they were kind of feisty. As for 2000, Webber was a beast in Game 1 vs LAL, especially the first quarter, and his passing in the 4th quarter of Game 4 was sublime. In the dead part of the NBA off-season, I’d highly recommend watching those games and other full length ones of him on YouTube.